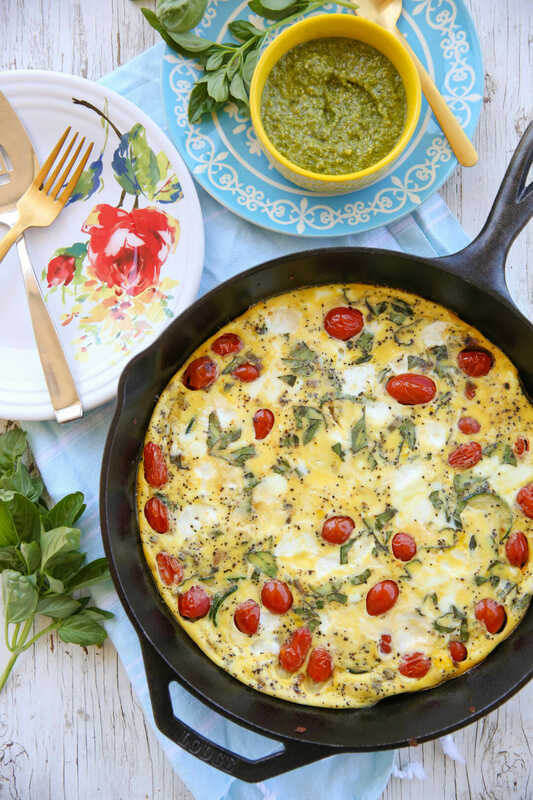 If you haven’t discovered the beauty of frittatas, it’s definitely something you should explore. They are the ultimate clean-out-the-fridge meal with endless variations. It’s kind of like an omlette, if you could make 6-8 omelets at one time and have the oven to most of the work. 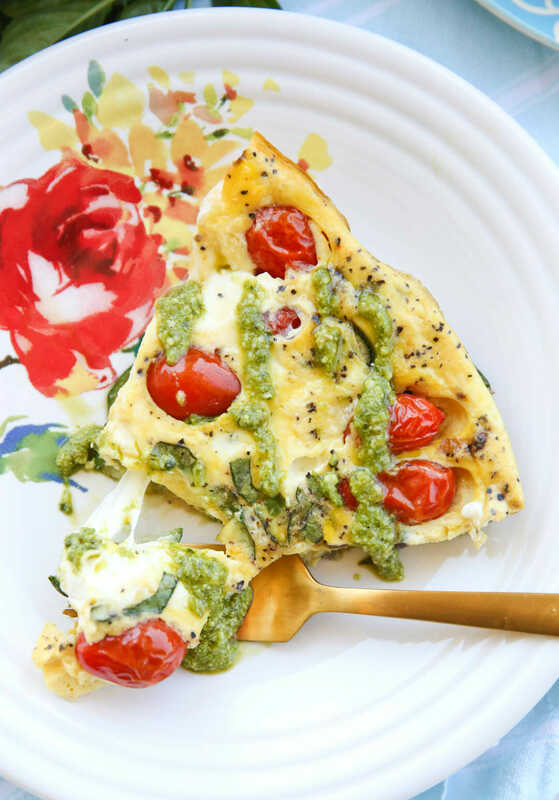 Basically you can add any variety of fillings, including starches like potatoes, rice, or even pasta, add in any vegetables and a few seasonings, and pour an egg mixture over the top, turning it into a crustless quiche-like meal that’s fabulous for breakfast, brunch, or dinner. Just pair it with a side salad or more commonly in our house, slices of buttered toast and fresh fruit, for a perfect no-fuss meal. 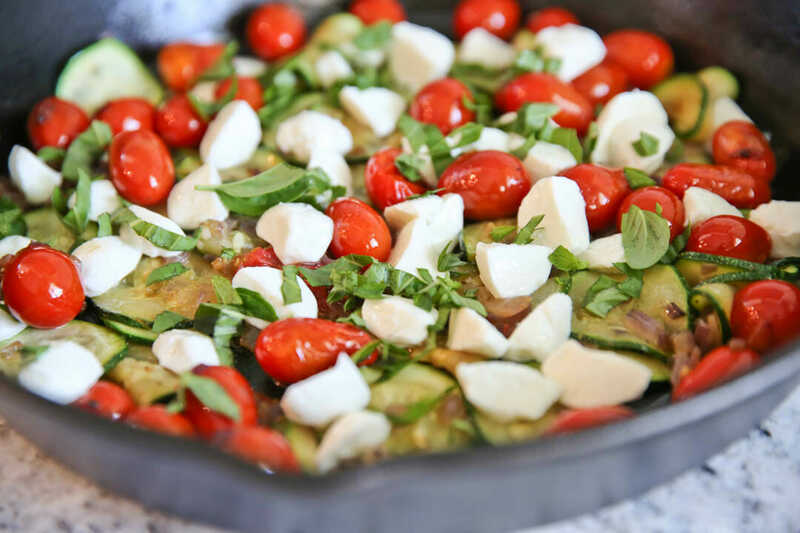 During the summer months, it seems like people are constantly looking for ways to use the same produce items from their gardens: tomatoes and zucchini, and the most common herb to grow during the summer is basil. So I figured a frittata using all of those things would be a good idea. It’s got a caprese theme, with fresh basil, creamy mozzarella, and bright cherry tomatoes. I even drizzle pesto over the top. 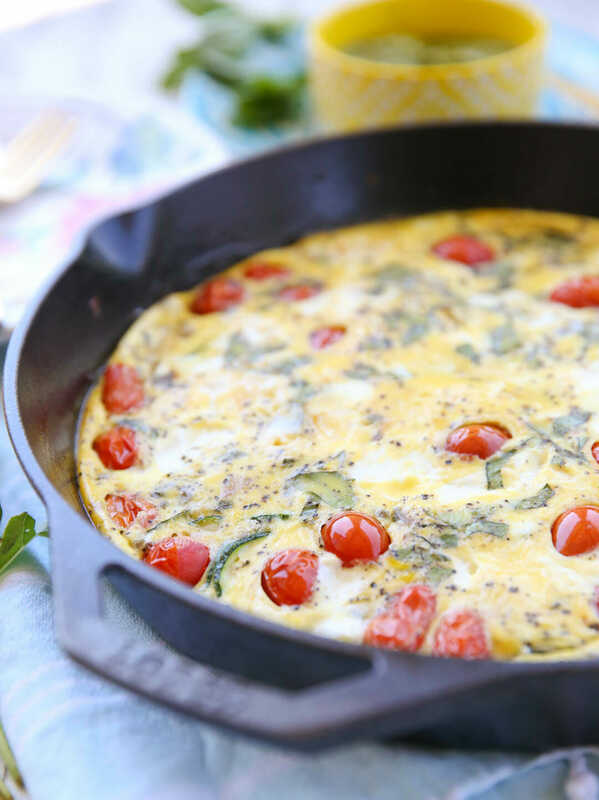 I love making frittatas in a cast-iron skillet, but any 2 quart baking dish or oven-proof skillet will work. 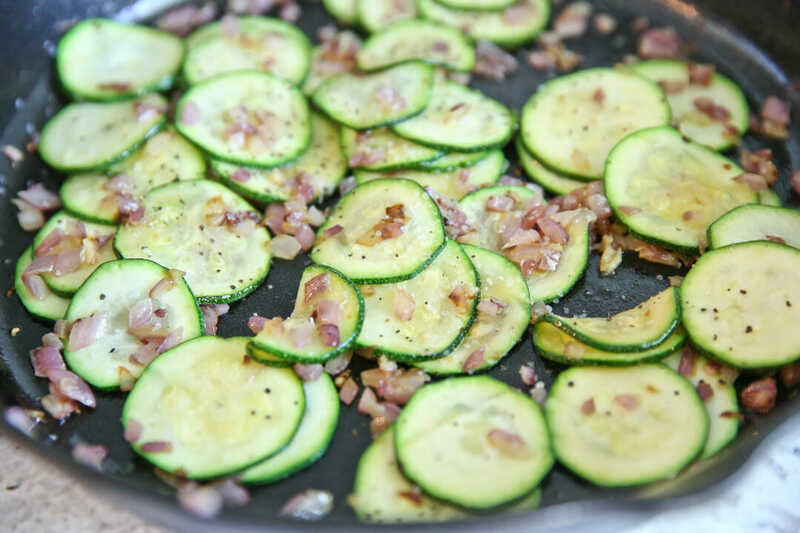 Start by sauteing diced onion and garlic and then tossing in the zucchini. I love our Basil Olive Oil for things like this! I’m using red onion here because I had one that needed to be eaten (remember this is a clean-out-the-fridge (or garden!) meal) but I prefer white in frittatas because red onion tends to turn gray-ish after baking. Still tastes great but I don’t love the look! When those are tender, push them to the side of the pan and toss the tomatoes in. They cook just until they start getting a little blistered and barely start to burst. Then I like to add a little pat of butter and stir it all around. Even though the veggies are sauteed in olive oil already, the butter helps ensure that the eggs don’t stick (plus hello- butter.) Arrange all of the vegetables in an even-ish layer and then sprinkle cheese and chopped basil over them. I’m using fresh mozzarella, but you could use shredded if you like. 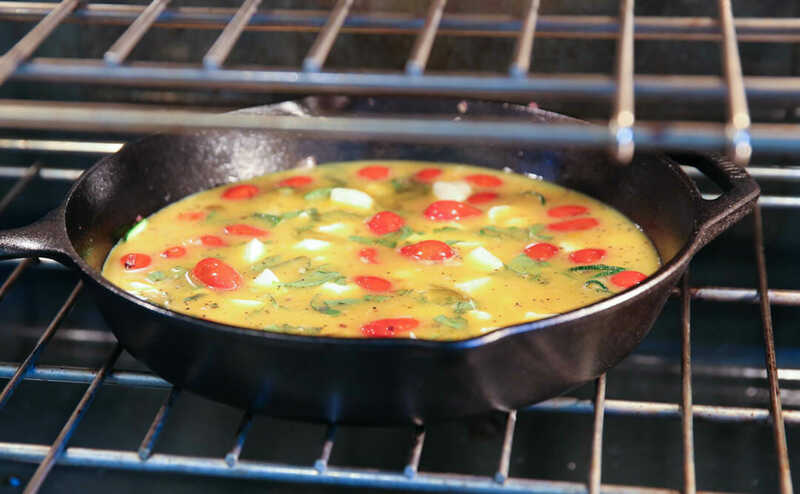 Carefully and slowly pour the egg mixture over the top and then transfer the pan to a preheated oven. It will cook for about 15-18 minutes. I usually stick a knife in the center to check if it’s cooked through. Be careful not to overcook because dry rubbery eggs are not delicious. Let it cool for a few minutes and then you’ll be good to go. If you want to make your own pesto ahead of time, click here for the recipe. I make this all summer long in small batches and just freeze it; it freezes beautifully. 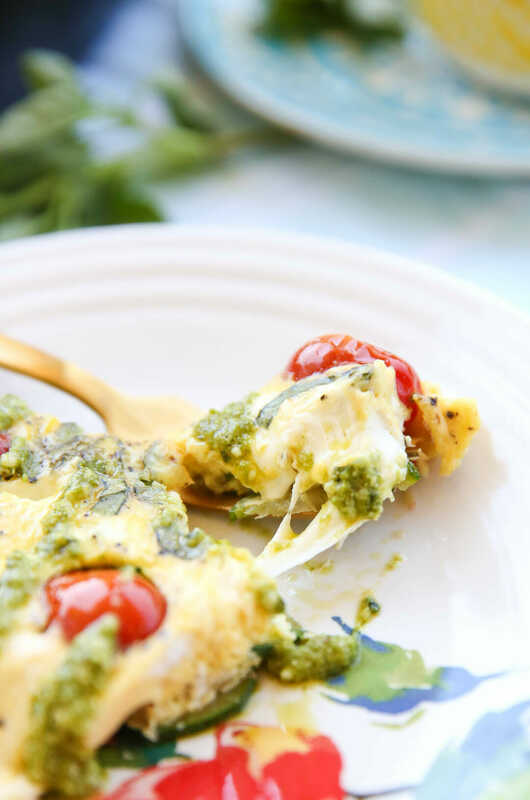 I like using the fresh mozzarella because then you get these warm gooey cheese bombs throughout the frittata. These are good warm, or at room temp (I always prefer warm) and the leftovers are even surprisingly great. I love a wedge re-heated on a slice of toast the next morning. Try this recipe out, or experiment with other veggie and meat combos. You’ll find it quickly becomes a go-to meal recipe! 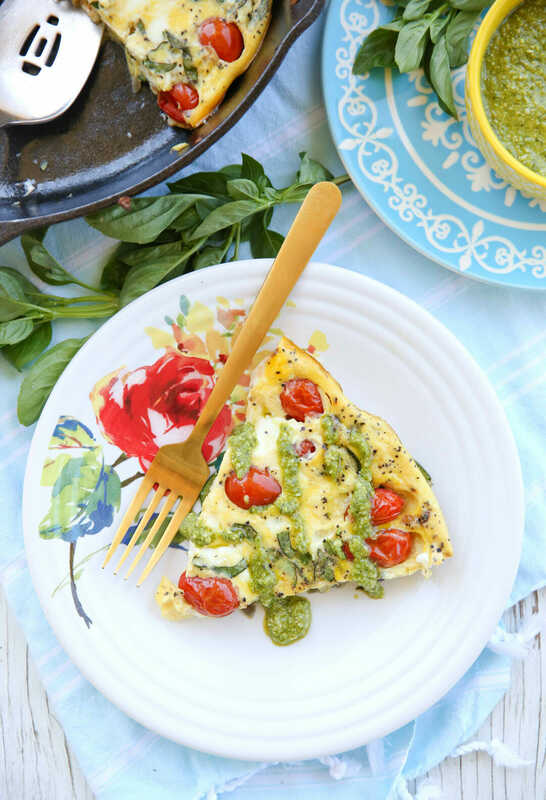 An easy and comforting egg dish, using commonly grown garden treasures like tomatoes, zucchini, and basil. In a mixing bowl, whisk together eggs, milk, 3/4 teaspoon salt and 1/2 teaspoon pepper until just combined. Heat a 12-inch cast iron (or other ovenproof skillet) skillet to medium heat. Add olive oil to coat pan. Saute onion for 3-4 minutes, until tender. Add garlic and zucchini and toss to cook until tender, about 3-5 minutes. Push everything to the side of the pan and add tomatoes, tossing to cook until lightly blistered and starting to burst. Sprinkle everything lightly with salt and pepper. Turn pan heat to low. Add butter to pan and toss everything together, arranging vegetables in an even layer. Sprinkle cheese and basil on top. Gently pour egg mixture over the vegetables and place pan in oven. Cook for about 15 minutes, or until eggs are set. Let cool for a few minutes and then slice into wedges. Serve with pesto. Yum.Just in time. Our garden is starting to produce a lot of zucchini and squash. This looks like such an easy weeknight meal! Totally making this tonight! It was 3:30 and I didn’t have anything planned for dinner. Then I remember seeing this recipe and I was so happy with how easy everything came together. We don’t grow cherry tomatoes so I just chopped up some larger ones and it worked great. I forgot to add the basil until a couple minutes into cooking time (probably because I had a baby on my hip and a cranky toddler on the couch) but it turned out fine. My meat loving husband enjoyed it too. I didn’t have any pesto, will have to plan for that next time. I served it with some rolls and a fruit smoothie. I am excited to have the leftovers tomorrow morning. Thank you! I guess if you doubled this you would have to transfer it to a 9×13 in the oven portion? And then make ahead wise if its easy to just do the oven portion when ready to eat it? Yes, you’ll need a larger pan if you double it, and you’ll want to cook it completely before cooling and storing.